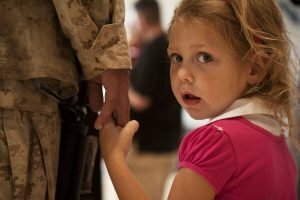 For the millions of children growing up with military parents, life can be very challenging and lonely, especially for those without any siblings. Each day while their folks are deployed overseas, these boys and girls are left alone at home, oftentimes taking care of themselves and one another. Despite being on their own most of the time, many of these military children are still able to handle their situations very well. Even with the frequent separations and relocations they experience through the years, they continue to be supportive and understanding of their parents. This is why the entire month of April is dedicated to these brave kids. The month of the Military Child is an annual observance aimed at giving due recognition to the children of our country’s service members. Like most military recognition events, this month-long occasion is observed within military communities and organizations. Some schools and outside communities also take part. Various events are held all month long to honor military families. They include parades, fairs, ceremonies, luncheons, and fun contests for everyone to enjoy. Since purple is the official color of the military, wearing it is one way to show your support and appreciation for these families. This contest invites military children to share their life stories through drawing. Each participant would be asked to explain their artwork, with the winner bringing home exciting prizes like iPad and Apple Mac units. Operation Megaphone gives the teenaged sons and daughters of troops the chance to connect with other military children in other parts of the world. It serves as a platform for these adolescents to open up and share their problems or basically just about anything in particular. Organize a party in your community. Invite every military family in your area for a night of fun, whether it’s at your own place or at a park. Don’t hesitate to ask for help from your neighbors or friends to organize the party with you, and be sure to include lots of fun games and rewards! Paint the town purple. Convince your friends, family, co-workers, or pretty much everyone you know to wear purple on Purple Up! Day. It’s as easy as that! Military care package night. Ideal for kids whose parents are currently deployed, this activity involves organizing different stations where children can create and personalize packages for delivery to their folks. Surprise them with sweet treats. If you have the time, visit a nearby school and surprise the kids with a bag of chocolates and candies. You’ll be Santa in April! Another way to observe the Month of the Military Child is by teaming up with Veteran Car Donations. If you own a car or motorcycle or any other type of vehicle that you don’t use anymore, hand it over to us. By doing so, you get to help our active-duty troops, veterans, and their families so they can live better lives. The proceeds from the sale of your donated vehicle will help our IRS-certified 501(c)(3) nonprofit partners in providing needy veterans with mortgage-free and specially adapted homes, free mental health care, employment opportunities, job training, transitioning assistance, tutoring support and education scholarships, financial assistance, life skills training, counseling, and many other benefits. Apart from getting rid of an unwanted vehicle for a worthy cause, you’ll also get the opportunity to receive a top tax deduction while enjoying our free pickup and towing services. You can donate to Veteran Car Donations by either calling us or filling out our secure online donation form. We accept vehicle donations wherever you are in the United States since we have car donation programs in all 50 states. Show You Care for our Heroes with Your Car Donation! You can best observe the Month of the Military Child this April by taking part in our vehicle donation program. Call us at 877-594-5822 and uplift the lives of our nation’s struggling heroes together with their families with your car donation!